Whence Then Hath It Cockle? Still, let me offer a response — a parable I recently heard at Mass. True, a parable is not an argument either; but at least it is not a tantrum. The kingdom of heaven is likened to a man that sowed good seeds in his field. But while men were asleep, his enemy came and oversowed cockle among the wheat and went his way. And when the blade was sprung up, and had brought forth fruit, then appeared also the cockle. And the servants of the goodman of the house coming said to him: Sir, didst thou not sow good seed in thy field? whence then hath it cockle? And he said to them: An enemy hath done this. And the servants said to him: Wilt thou that we go and gather it up? And he said: No, lest perhaps gathering up the cockle, you root up the wheat also together with it. Suffer both to grow until the harvest, and in the time of the harvest I will say to the reapers: Gather up first the cockle, and bind it into bundles to burn, but the wheat gather ye into my barn. There you go. God plants the wheat. It is not He who plants the cockle. And why does God not immediately uproot the cockle? Because doing so risks uprooting the wheat. Again, the point of a parable is not a QED. Parables illuminate. Simply see it: Removing the evil cockle would uproot the good wheat. Not because good requires evil; but because good would be ruined by the act of removal. And though one could here begin a great exegesis, leading to some great theodicean schema, that endeavor would be against the spirit of a parable; and of a post in a blog. Why Not Try Harder With Your Conflict? 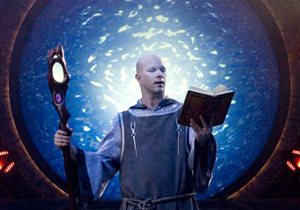 There's a couple of things I dislike about the Ori arc in Stargate SG-1. Second, the Ori offer enlightenment and outright ascension to their followers. Those who heed Origin will themselves become gods! But then it is revealed that this is a lie. The Ori want followers only to literally consume the energy of belief. Ascension will never be granted to anyone. Origin is a fraud. This, I think, I dislike even more than the arc's implicit Christophobia — which, these days, I'm somewhat resigned to. Haters gonna hate. Amirite? But to posit a religion as a fraud? That is artistically tedious. The modern screenwriter, being so far removed from true religion and bound, by his university-credentialed brilliance, to the truths of SCIENCE! alone, cannot even imagine religion as anything other than fraud. Gods aren't real; God isn't real. How do I know? The SCIENCE! tells me so! We might, as Good Liberals, indulge the ethnic employment of religion. Aren't those Mexicans adorable with their Signs of the Cross? Aren't those Blacks adorable with their Gospel Spirituality? And my, the little bon mots we can extract from the religious expressions of these adorable ethnics! Despite the fraudulence of their silly religions. But imagine the Ori weren't lying. Imagine that ascension truly awaited the followers of Origin. Imagine that Origin was not a fraud. Suddenly the Ori arc is interesting. It's easy to fight charlatans. The moral high ground is so very high. But what if your foe is not a charlatan? Where then is your moral high ground? Is it right to oppose the dissemination of enlightenment? When the rewards are so great? The truths so real? True dilemmas arise. It's not so easy anymore. The Crusade has a point after all. It is bloody, yes. But not pointless. The conflict between the Ori and Stargate Command is suddenly deep. Or at least not tedious. Since I actually like the trappings of medieval Christianity, I mostly enjoy the Ori arc even as it irritates me. They squeezed a lot of decent adventure into two seasons. (Squeezed perhaps too much: One potentially deep and interesting story — the implantation of a Goa'uld into the incarnated avatar of the ascended Ori — was somewhat flaccidly disposed of in a single episode. That story should have been a three parter, the very climax of the Ori arc. Oh well.) I also like Tomin, and Vala's relationship with him. And finally I have one word for you: morenabaccarin. It was the Third Symphony of Jean Sibelius, as performed by the Philharmonia Orchestra, conducted by Vladimir Ashkenazy, recorded in June 1984. I know these details because, even when I eventually got the CD, I got the exact same recording. I am reading the liner notes as I write. Now, I am profoundly susceptible to music. My reactions are acute. Sometimes I am infatuated only; sometimes I am ceaselessly bound. Sibelius's Third is still beautiful to me. It raises and stirs, thirty years on. Beauty is not precisely in the eye of the beholder. All beautiful things are imperfect and being imperfect are not perfectly beautiful. Besides, one who beholds is imperfect, too, and cannot apprehend beauty perfectly. It is all piecemeal. So it is not surprising that we disagree on what is beautiful. That said, beauty is not a matter of opinion. We are moved by a beautiful thing because we are sensing Beauty Itself. A truly beautiful thing partakes of God. That is why a beautiful thing makes life good. Living on Earth is a rotten business. A beautiful thing consoles and compensates. When I listen to Sibelius's Third I am glad I have ears. I am reminded that misery is a privation, not an end. I am glad that I am still breathing. And then I wonder: Would the Third even matter to me in the afterlife? Assume I get to Heaven. Assume I am granted the Beatific Vision. Seeing God fully means apprehending Beauty at Its Source. No need for reflections or consolations. Sibelius's Third Symphony is of the Earth and would be superfluous in Heaven. I can tell myself that, being in Heaven, my understanding would be under grace and I would not even miss the Third, nor think it sad that I don't need or want to listen to it. I would understand that even a great work is unnecessary when there is no misery to counteract. I wouldn't even feel a loss, since loss cannot exist in Heaven. Even after the Resurrection, when we would all be restored to our bodies and again in some sort of material life, the grace of Heaven would persist. We won't need symphonies nor any example of artifacted beauty. Presumably they wouldn't even attract us since we would have no unsatisfied appetites. Will we stop loving each other because we are immersed in grace? Will we stop enjoying what can be enjoyed, whether it is our family or the sun or the moon or whatever might constitute the consummated universe? Maybe the Third will be superfluous. Or maybe you can never have too much beauty, and we will listen with an even greater joy than before. The person who bristles at being labeled is being childish. You are not a special snowflake; you are always a member of some category. The only matter with a label is its accuracy. So I am David. David is not a soul inhabiting a body. My body is not a vessel. There is no ghost in the machine. While my soul, having immaterial aspects due to its rational nature, can exist apart from its material aspects, a human soul without a body is incomplete. Truncated; crippled. My soul is the form of David and that form properly entails the material. I am reducible to neither my body nor my soul. There is a tendency these days to think of the mind as a computer plugged into a body. It seems a useful analogy, sometimes. The problem is that one starts to think of separated processes in the mind because that is how computers work. Most especially, one thinks that the "mind" is the conscious bit of oneself, the you, and the unconscious bits are just the "brain," all but independent of the true self. However, much as you must stop thinking of the soul and body as independent, you must stop thinking of the mind and brain as independent. When you drive to work and are thinking the whole time about something else and yet you are stopping at traffic lights and making those familiar turns, it is not a drive-to-work brain-bound subroutine that is getting you there, but you. There is only one actor. And that assertion is not semantic; it is metaphysical. Now, I'm not going to give a thoroughgoing defense of this idea. A good Thomist can do so (visit Edward Feser whenever you can). Rather, in this little blog post, I want only to prompt a shift in your thinking. Do you recall that experiment that "proved" free will was an illusion? I recall that, eventually, the empirical facts were shown to be wrong; but accept that the experiment was empirically accurate in its results. The "proof" was that when a subject picked up a cup, the brain fired off the muscle signals to pick up the cup before the subject consciously acted to pick up the cup. In other words, the decision to pick up the cup followed the movement to do so. As you can see, the problem in this "proof" is the presumption that the conscious part of you is all of you; more subtly, that free will is implicated only in consciousness. Or consider this. The free will in this case doesn't consist in the "decision" to pick up the cup; the free will was prior to that, when the subject decided to do what was asked of him. Picking up a cup does not require will as such. The subject knows how to pick up a cup. He is primed to act already. His muscles are in play even before he is consciously aware of what he is doing. If the subject were instead told to stab someone, an if-then morality check — i.e., his conscience — kicks in. The muscle process is blocked. The consciousness is made aware, affirms the delay, and no stabbing occurs. And a well-formed conscience — that perennial check on "mindless" action — is the result of prior learning and training; of prior free will. Even the reflexive refusal to stab a man is ultimately the consequence of free will, whatever the milliseconds timing of this or that neuronal impulse. Or consider this. Ultimately the mind is immaterial. The decision to act is made in an immaterial space. That a material detection of a "decision" should follow the material detection of a "movement" does not tell you what happened prior to both in the immaterial aspect of the mind. When considering what has occupied thinkers until the modern age, it strikes me how unabashedly they ruminated on the non-material. For ancient and medieval thinkers, material things were not ultimate things, and truly ultimate things can and should be understood. Modern materialists simply lack imagination. Maybe it is better to say that their imaginations cannot escape their machines and mathematics. Whatever strength of imagination they do have — to imagine, say, a warp in spacetime — they reject any concepts not reducible to the material. In any event, it seems that much of the difficulty in accepting God is rooted in an abandonment of philosophy. Natural science has progressively estranged itself from its parent. The modern materialist, at heart a scientist, no longer wonders about causes formal, efficient, and final. He simply doesn't wonder. They don't matter to him. He has, indeed, lost the very language to discuss them. All the terms and theories and modes and categories have been cast aside. And why? Because all of them were devised at first to explain the mundane: Why do things grow? Why do things fall? Why do things live? Why do things burn? Yet having explained the mundane with all his equations and having presumed there is an equation for everything, the materialist has no more need for philosophy. Never mind Aristotle and Aquinas and their ilk. Consider animism. How is that things move? How is that some of them clearly move deliberately? Is there something that facilitates this animation of things? There is clearly a distinction between living and dead. Something enlivens. And is "living" restricted to beasts? Isn't the wind alive? Shouldn't it, too, have an animating spirit, as much as a mouse? Indeed, are any objects free of spirit? Is it not possible that all objects contain a spirit? This is not an idiotic line of inquiry. It is reasonable. Just because we have since concluded that the wind has no spirit doesn't mean the evidence isn't there. What is unfortunate is that, having concluded via science that the wind is just an effect of the variously accelerated molecules in the atmosphere, the intuition at the core of animism has been lost. Did you know that the ancients even supposed that abstract emotions had spirits? Love was not only something experienced but something existent, an entity in possession of its own animating spirit. This is downright alien to modern thinking. It may be a refined animism far from the fields and forests, but it is still an animism. Now, when we Christians say that God is Love, what are we saying, after all? We are saying that Love is an entity animated by a Spirit. Yet the materialist has so thoroughly discarded animistic thinking, he can't even suppose that Love might be more that just an affect of creatures. He can't imagine Love as Being. Sadly for him, so much of God is like that; and since he can't manage the tiniest bit of animistic thinking, he imagines God as only a kind of Spaghetti Monster. The materialist simply hasn't the philosophical disposition — the necessary cognitive tools — to transcend his inadequate notions of God.